Diptyque Eau Plurielle is designed as an all-purpose fragrance. You can spray it on linen, spritz it as an air freshener, and use it as a personal perfume. Need a whiff of rose garden in your stuffy office? Spritz spritz, and your cubicle walls waft June morning at Butchart Gardens. The dog’s bed smells a little feral? Toss it in the washer, anoint with Eau Plurielle, and now Fido could march in the Rose Parade. (Even better, with Eau Plurielle you can be twinsies, scent-wise.) Diptyque complemented Eau Plurielle’s launch with the Rosafolia candle and scented wax oval. Those of us who love perfume have been making it do double-duty for a long time. I spray Guerlain Eau Impériale on my mattress when I change the sheets. Occasionally I toss a handkerchief dampened with Santa Maria Novella Acqua di Colonia in the dryer with my laundry, and perfume samples often find their way into my handwash. Once I even followed Nureyev’s move and sprayed my curtains with Guerlain Mitsouko, but I probably won’t do that again — it was a little too gothic for me. Eau Plurielle, though, is all roses and linen and not a bit gothic. Eau Plurielle’s notes include Turkish rose, ivy, hesperidic notes, galbanum, geranium, musk, wood and cedar. In brief, it smells like a wet, green rose with a hint of fruity sweetness and a full head of steam-iron freshness. On skin, Eau Plurielle’s clean, slightly metallic aldehydes hit my nose first. I used to steam dresses in a vintage clothing boutique, and if I had my way, this is how the steam would have smelled. Underlying this clean — but not soapy — scent is a summer rose with a tart edge. Eau Plurielle’s musk and cedar add the tiniest sliver of soap-like feel, but the fragrance doesn’t come off as laundry detergent. Eau Plurielle is tart, but still full and rounded and smooth. It wears evenly and smells pretty much the same in the afternoon as it did in the morning. For what is billed as a light cologne, it wears at least five hours on my skin and a full day on my scarf, and it packs a surprisingly vigorous sillage. So, is Eau Plurielle worth buying? For the upscale home not as obsessed with fragrance as many of us are, in my opinion Eau Plurielle is a must-buy. For them, a $90 bottle of air freshener/cologne is an affordable luxury worlds above an alternative like Febreze, and if they like rose, it's a pretty, if unexciting, personal perfume. For those of us who love more sophisticated scent, and for whom $90 is the gas bill, we might do better to stick to our standbys of line-dried laundry, the occasional stick of Japanese incense, and not-quite-favorite decants to liven our homes. Do you use perfume around the home? Which “people” fragrances do you like best for the home? Diptyque Eau Plurielle is $90 for 200 ml. The complementing Rosafolia candle is $65 for 190 grams (about a 90 hour burn time) and the Rosafolia scented oval is $50. For information on where to buy Eau Plurielle, see Diptyque under Perfume Houses. Hmmm. It sounds very pretty, but I think I prefer candles (with a watchful eye on the cat, of course) to room sprays. My favorite is Cire Trudon Abd el Kader, a seriously mouthwatering mint. I love Cire Trudon candles! They’re so expensive–but so luxurious. I haven’t smelled this one, but it sounds great. Another fan of Cire Trudon, here. They are indeed super expensive, and I think I’ve only ever purchased two. But. They smell amazing. Not, “Mmm, that smells really good.” More like, “Aah, I am going to keep my nose in this glass smelling cloche and breathe deeply until I deplete it of all oxygen.” Spiritus Sancti is my favorite, I think. I’ve had the one that’s a fresh tuberose (can’t remember the name right now) and the Roi Soleil one, and they were both terrific. My brother recently gave me some perfume from Italy that is heavy on lemon and linden. A little to “fresh” for me to apply on skin, but perfect as linen spray. btw, loved the issue of the newsletter this morning! Lemon and linden would be ideal for a room and linen spray! I’m glad you enjoyed the newsletter. I have a lot of fun writing them. Sounds lovely – what was the brand? L’Erbolario, which from what I gather is akin to L’Occitane as far as offerings/price point. The scent is called Ombra di Tiglio. Was in Diptyque just today and was given a sample of this. I agree with you that for the upscale home it makes perfect scense. Vert light and carefree, good casual scent in spring/summer. And it lasts a really long time for what it is! Gosh, so well put Angela! It’s a lovely thing to see such a fair-minded consideration of what a scent can offer to different customers. I imagine it can be tough to review scents without (intentionally or not) getting prescriptive about how people -ought- to relate to perfume as a medium. Such a nice example of an approach that’s more ecumenical, without sacrificing specificity or the right to an opinion on quality! Brava. It’s very easy for me to get bossy about perfume, so I really appreciate your comment–thank you! I agree with C.H.. It’s fun to read (and for that master to write) the snarky stuff but it’s also good to take a step back and consider a perfume from the point of view of its intended audience. The first of your reviews that I read was for l’occitane Rose 4 Reines. I remember being miffed by your skewering of the l’occitane brand as artificial luxury for the masses. Since then I’ve come to see your point of view as a lover of vintage fragrances. Believe me, I didn’t even know that vintage fragrances were a thing when I started reading this blog. Anyways, rereading that review, I completely understand what you were saying and I even enjoy the snarky way that you said it. I think I’m rambling now so let me just say thanks for all your reviews. (Even though of all the contributors, I’m least likely to seek out something you review. Maybe some day I’ll get into vintage fragrance but I doubt it.) Finally, objectivity is all well and good but don’t ever lose your snark. Thanks for the vote of confidence! And I’m ashamed to admit that I don’t even remember the 4 Reines review–I should go back and look at it and see what I think now. Well let me know what you think of it. I think you were being much more tongue in cheek than I realized at the time (this being about two years ago when I had just discovered this blog). I was like who is writing this, Lucille Bluth? Lucille Bluth?! Yet something else for me to look up! The mother from Arrested Development. Sounds like something would probably enjoy. But as you put so well, it’s more reasonable for me to invest on ‘true’ perfumes. My home has been wearing EA Green Tea and Camelia, Penhaligon’s Bluebell, AC Vanille Insensée… All sorts of stuff my skin does not love. Very nice! It’s gratifying to know that we can always enjoy certain fragrances we love on fabric but not on skin. Some florals are that way for me, too. To be completely fair, I’m not particularly fond of these fragrances, not even on fabric. I just want to use them up, lol. I like to use 4711 or regular old rose or orange blossom cooking waters for room sprays and fresheners. I also recently discovered the Aveda “chakras” fragrance line and like #1 and #2 also as room sprays more than I like to put them on my skin – they really last in the air too. 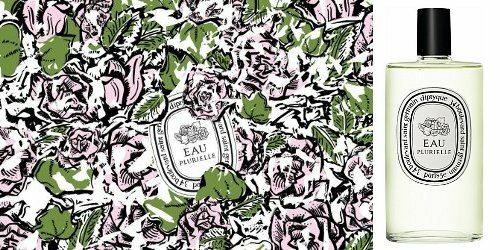 I didn’t care much for eau Rose – surprising since I like roses so much – so I would be happy if a bottle of Plurielle fell into my lap, but I’m not likely to buy one. And I really love Diptyque. I wish I could have almost every frag they make! I’ve got my eye on Vetyverio and am very curious to test eau Moheli. Strangely, I’ve never thought about using culinary rose or orange blossom water as a home spray, but it makes so much sense! Plus, they’re so affordable. I almost loved volutes – and I can’t remember if I tested the edt or edp – but that tad bit of cig smoke just got to me. Otherwise, a winner. My fav’s are Eau Lente and Eau Duelle. But I’ve not tested most of the line. I am eaglerly awaiting an unloved sample of Tam Dao from freebiemeet! I set a tester strip sprayed with Duelle on my desk one afternoon, and when I returned the next day, my whole office smelled delicious! Tam Dao is great–what a score. I would imagine quite a few NST readers pay their gas bill AND have $90 to spend on a home scent such as Eau Plurielle if we wished. And more power (and not just gas power) to you! I do love how the comment thread here is a wonderful equalizer of people from students to more well-to-do folk. Surprised that’s your impression. A big part of reading NST for me is precisely because my budget is limited (to speak concretely: I peg it at $30/month, all in for bottles, samples, decant supplies, swap postage, etc.–even then it’s highly questionable whether I can really afford an on-going expense or should stop all purchases and just use what I have.) I enjoy reading about perfume, of course, but I also read to make sure what I’m buying is really, absolutely worth it. I’ve always imagined that people who have a lot more money than I do might not feel pressed to do as much legwork. I’ve come to believe that having constraints can sometimes lead to more creativity–and sometimes even more pleasure–as long as your basic needs are met, of course. That said, I’m sure I would make an excellent millionaire. Seriously. I would make an excellent millionaire, too! And retiree. I could be retired tomorrow, if I could afford it, and never run out of things to do! Hear, hear! I am always puzzled by people who say they just wouldn’t know what to do with themselves if they didn’t work. I would retire in an instant, and do the million things I’m always wishing I had time for. Absolutely. I have gardens to weed, books to write, cities to visit—the list goes on and on. The Hermes Jardin series double really well as home and linen sprays, especially the Mediteranee with its lavendar notes. Oh, I hadn’t thought of that, but I bet they are! I wouldn’t mind sheets smelling of Mediteranee, that’s for sure. Tea rose and truth or dare by Madonna are two go too’s for room fresheners . Thanks for the hand wash tip ! Cheap and cheerful, strong and lingering–hey, I think I dated that guy! I’ve used Tearose, too! Although I maybe made a mistake spraying some guest linens with it once—I could still smell it on the unused towels a month later! It really is nicer when the scent doesn’t stick around too long. That’s why I love Eau Imperiale on my mattress. It’s fresh, then kind of disappears. Yes , it’s certainly is a stayer ! Thanks for the review. I am very curious about this one. Diptique is very hit or miss for me. I expected to love Eau Rose, but it did not do well on my skin. Same for the geranium and lavender releases, but I really enjoy the L’Eau de Neroli, and have tried to justify 200mL of that. Eau Plurielle sounds lovely. It’s just huge; I don’t need 200mL of anything. . . but I can be tempted to go sniff. (Even with snark) Be well. The bottle doesn’t look as humongous as it sounds–although I know what you mean about not needing 200 ml of anything! I got a sample of the Eau de Lavande, but I haven’t tried it yet. Does anyone have much experience with the scented wax ovals? Was considering one for the bathroom, or are they best for a closet? I love Baies but haven’t splurged on a candle. I saw the wax ovals, and they’re satisfyingly heavy in the hand, but I don’t know how they perform as fresheners. Maybe someone else here will be able to give you a better answer. I thought they were ceramic? Either way, ive only seen them. I doubt id pay that much for something that would inevitably lose its scent..
Maybe they are–that would explain the weight. I’m with you, though. I’d probably be more tempted to go for the candle. You’re both right — they’re scented wax in a porcelain medallion. My go-to perfume-gone-home-sprays are Guerlain Vetiver and Balenciaga Paris. Either make my house feel so clean and fresh post-vacuuming! Although, since I’ve discovered the Cilantro and Citrus reed diffuser from Pier One, I rely on that far more often to give a room a fresh scent. It’s really lovely with a light hand, wafting through a space! Oh, both of those would be great choices around the house! I haven’t tried the Pier One diffuser, but cilantro is intriguing. Eau Plurielle sounds lovely! Dyptique is one of my “someday, I’ll most definitely find the time” fragrance lines. I hardly shop at the mall (read: Nordstrom) anymore. It’s just not part of my life right now, so I don’t often get to sniff testers. Online shopping is it for me. The Dyptique Eau de Lavande mentioned above also sounds wonderful. Love, love, love lavender. I love using scents in the home. I spritz linens with my old, dwindling bottle of Roger et Gallet Lavande Royale. I also love PW Tea Rose for scenting the air and fabrics such as a handkerchief to tuck in a coat pocket or handbag. I have a purse spray of Songes that I sometimes spritz on myself when I’m on my way somewhere in the car. It makes the car smell nice, too. I always enjoy your reviews and writing, Angela. I’m glad your newsletter was mentioned in the comments . . . I just signed up. Great idea–I should keep a small bottle of perfume in the car! Maybe a leather scent so I could pretend I was in a Jaguar instead of an old pickup. Thank you for the compliment, and I hope you enjoy the newsletter. It comes out monthly. 4711s and Florida/Kananga Water is great for skin in the summer AND linens. I have splurged on quality bed sheets in the past couple of years, and after ironing and making my bed I spritz on either an old 4711 cologne lying about OR old Caribbean school Florida or Kananga water. Very refreshing, especially when the weather is warmer. Sounds nice but please don’t confront your dog or its belongings with perfume. The poor thing has such a sensitive nose, that is just too much. Thank you for your advice! It’s always nice to hear from an animal lover (I adore animals and will always have pets). I spray all kinds of perfume around the house! It’s a chance to use up the frankly ridiculous amount of fragrance I’ve amassed, creates a scent cloud that’s easy to appreciate, and makes me feel better about all of those blind buys that didn’t quite work out as hoped. I perceive the scents much differently when sprayed on objects than when on skin – I think I’m much less discriminating (or judgmental, if you prefer). I especially love using perfume as a closet spray – in current rotation is Reem Acra, Un Jardin Sur le Nil, and Queen Latifah. I love your high-low combo! Do you just spray the closet in general, or is there a “scent object” you spray in there? Nope, I just spray randomly – air, corners, shoe shelves – though I usually avoid spritzing onto clothing, so that the closet perfume doesn’t interfere with my daily scent choice. I keep bottles stashed around the house to use as home sprays – it’s a nice way to have beautiful scent at my fingertips, and often the bottle can serve as a decorative element, wherever it’s placed. I’ll definitely have to try that. A little Santa Maria Novella in my closet would be very nice!